The Detroit Pistons made it to the playoffs in 2015, only to be defeated by the Cleveland Cavaliers in the first round, 4-0. Ironically, this result was a repeat seven years ago when the Pistons lost to the Cavaliers, 4-0 in the first round after the 2008-09 season. The Detroit Pistons have been going through a rough patch. Take their last year's performance for instance. The Pistons finished ninth in their Conference and fourth in their Division. They won 39 games and lost 43. After winning the NBA Finals against the Los Angeles Lakers in 2004, they reached the playoffs for the next five years consecutively. However, since the 2008-09 season, it seems the Pistons are firing blanks. All is not lost for Detroit, however. The 2018 season looks promising with the likes of Andre Drummond, Dwight Buycks, Blake Griffin, and Luke Kennard. The Pistons are back and ready to make some noise in the Eastern Conference playoff picture. Led by a highly talented youthful core, Detroit looks poised to regain their spot atop of the Central division and bring home another NBA championship. Division rivals, the Indiana Pacers and the Milwaukee Bucks will fight to keep the Pistons down. Grab your Detroit Pistons tickets and head down to the Palace of Auburn Hills to be apart of your team's championship hunt. Founded in 1941, the Detroit Pistons are a member club of the NBA’s Eastern Conference Central Division. With three NBA Championships, seven Conference titles and nine Division titles, the Pistons have had many memorable moments in their history. The ‘Bad Boys’ First NBA Title – The Piston had a phenomenal run during the 1988-89 season. The ‘Bad Boys’ came first in their Conference and Division by winning 63 games and losing only 19. In the playoffs, the Pistons railroaded the Boston Celtics 3-0 in the first round. They whitewashed the Milwaukee Bucks, 4-0 in the Conference Semi Finals. Their only competition came in the form of Chicago Bulls who won two games but ultimately lost the Conference Finals, 4-2. And for the NBA Finals, the Pistons took on the Los Angeles Lakers annihilating them, 4-0 to win their first title. In the playoffs, the Detroit Pistons lost only two games out of fifteen. Guard and Piston’s life timer, Joe Dumars was voted the NBA Finals MVP averaging 27.3 points per game. The Drafting of Isiah Thomas – Even though Isiah Thomas was the second overall pick in the 1981 draft, this 6 ft 1 inch Point Guard slowly made his presence felt in the team. Coach Jack McCloskey knew from the beginning the 20 year old Point Guard from Indiana would make a big difference in the lineup. And difference he did make. Thomas spent his entire playing career with the Pistons, winning two NBA Championships (1989 & 1990). Named in the 50 Greatest Players in NBA History list, Thomas was also inducted into the Naismith Memorial Basketball Hall of Fame. With more than half a century in the NBA, The Detroit Pistons, along with titles, has won many rivals. Two that stand out the most are the Los Angeles Lakers and the Boston Celtics. Los Angeles Lakers – Its Motor City versus the City of Angels. These two remarkably talented teams have played 334 regular season games, out of which the Lakers have the lead with 204 wins with 131 for the Pistons. The playoff record however is a little close to call. Out of a total of 47 playoff games, the Lakers have won 26 and the Pistons have 21 wins in their corner. The fact that the Pistons won their first ever NBA Championship by trouncing the Lakers makes it all the more intense. Also the face-offs between their top talent like Kareem Abdul-Jabbar, Joe Dumars, Magic Johnson, Isiah Thomas and Bill Laimbeer made this contest both exciting and competitive. Boston Celtics – There is a pretty good reason why the Pistons don’t like the Celtics. First off it’s the statistics. Boston and Detroit have met a total of 370 times in the regular season. The Celtics lead with 236 wins with a 134 for the Pistons. The rival’s playoff record stands a little closer. Out of the 45 playoff games, the Celtics have 24 wins and 21 losses against the Detroit Pistons. Since 1991, the Pistons have been unable to defeat the Celtics in the playoffs. These include the 2002 Eastern Conference Semi Finals and the 2008 Eastern Conference Finals. The Detroit Pistons have had a long and diverse lineup of exceptionally talented players on their roster. Over the years, these athletes have pushed the Piston’s stock up in the league. You can’t go through the Pistons greatest list without mentioning Isiah Thomas. This 1981 NCAA Champion averaged 19.2 points, 9.3 assists and 1.9 steals per game. Thomas spent his entire playing career with the Pistons from 1981 to 1994. During his tenure, Thomas won two NBA Championships, became the NBA Finals MVP in 1990 and was a twelve time NBA All Star. He was inducted into the College Basketball Hall of Fame in 2006. Joe Dumars is another player who played an instrumental role in the Pistons success. Hailing from Shreveport, Louisiana, Dumars could play both shooting guard and point guard. He also doubled as a highly effective defender. During his fourteen year career with the Pistons, Dumars averaged 16.1 points per game, 2.2 rebounds and 4.5 assists per game. With six All Star selections, Dumars jersey number 4 was retired in March 2000. A couple of other players who deserve mention in the Pistons greatest list are Ben Wallace, Bill Laimbeer, Chauncey Billups, Dennis Rodman and Bob Lanier. One of the most legendary venues in the NBA, the Palace is the place to be to catch some NBA action. To go along with one of the most devoted fan bases in sports, you cant go wrong with a night out watching the Pistons in action. Catch the Pistons in action with Detroit Pistons Season tickets. With a few fresh faces included in the lineup, the Pistons are looking to reach the playoffs again. Don’t miss out and get your Detroit Pistons tickets from here now. Our process for purchasing cheap Detroit Pistons tickets is simple and fast. There are so many online ticketing sites, that it can be hard for customers to find the right place to buy Detroit Pistons tickets at the cheapest price. At ScoreBig we think of our customers first and foremost. We offer daily deals for Detroit Pistons events, so our customers can get the best seats for the best prices. ScoreBig will always go above and beyond to offer the cheapest Detroit Pistons tickets on the market. The Detroit Pistons schedule above, displays all available events for 2019 and 2020. Once you find the event that you would like to go to, click the red “Get Tickets” button. It is located on the right-hand side of the event listing, it will take you to an Detroit Pistons event ticket page. ScoreBig's event ticket page will display all available Detroit Pistons tickets for that event. On the event ticket page to help with your search for the right Detroit Pistons tickets, use the filters at the top to select quantity, price range, and more. There is also an interactive seating chart so you can pick where you want to sit. When you are ready to buy a ticket, click on the listing, and you will be directed to ScoreBig's checkout page. Upon completion of the information fields, your order will be processed and your Detroit Pistons tickets will be delivered via email, mail, or to your mobile device. What makes ScoreBig’s site stand out from the rest? We are constantly analyzing our competitors to improve our site, service, and prices. ScoreBig.com employees strive to offer the best process and experience to buy cheap Detroit Pistons tickets. Our goal is to get you the best seats to Detroit Pistons events. We offer daily discounts on our site and for special promotions check out our newsletter. If there are no Detroit Pistons events currently available, you can use our search feature at the top of the page to see a list of all popular events going on near you. No matter your price point, we have all the best deals and discounts on Detroit Pistons tickets. For more information on prices of Detroit Pistons tickets and the schedule for Detroit Pistons, check out our listings above. The last thing you want to find out is when the Detroit Pistons event you wanted to go to is sold-out. Don’t worry in many cases ScoreBig has affordable tickets to sold out events. We sell tickets from GA all the way to premium seating and parking. Skip the scalpers in the parking lot and get your tickets online from top Detroit Pistons ticket brokers. We get you in all events, buy your Detroit Pistons tickets here from a brand that many trust and rely on for all their ticketing needs. ScoreBig offers a 100% money-back guarantee. If you have been in search of cheap tickets for Detroit Pistons, ScoreBig by far is the best option. That’s why ScoreBig has more loyal customers than any other ticketing site. 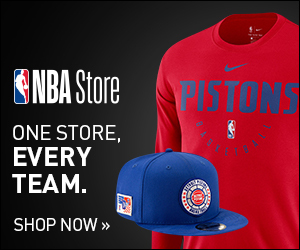 Shop at ScoreBig for safe and secure Detroit Pistons event tickets.